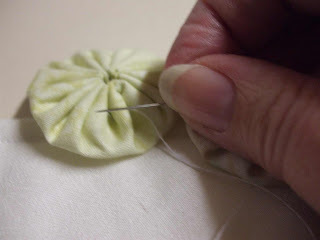 Last night I sewed my first real stitches in 3 1/2 weeks. I managed to sew down 9 yo yo's onto the edge of my Florentine Doily. When it started to hurt I stopped stitching and will try again in another few days. But for now I am happy with that effort. 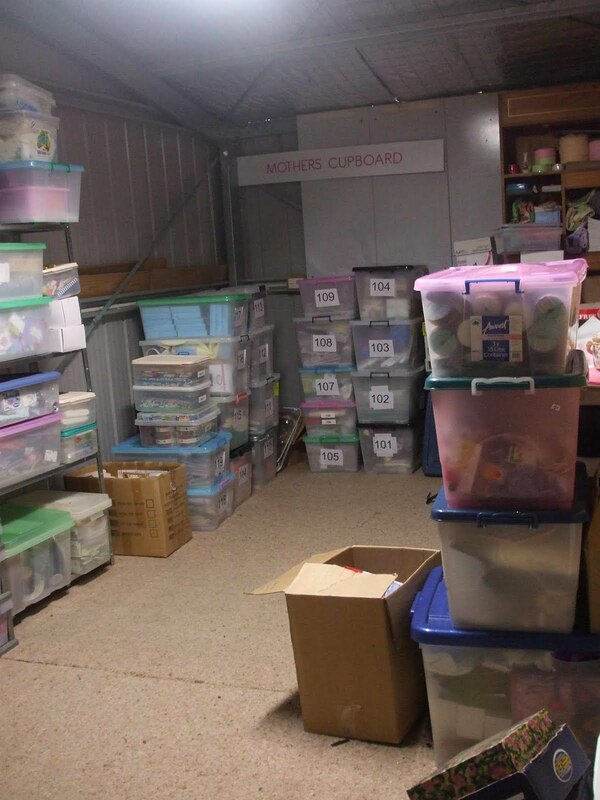 I have spent some time lately getting the "Mothers Cupboard" stock room organised. My Fabrics live in the house but all of the other stock is recorded and then filed away in tubs. Mr MC helped me with the lifting and now I feel much more organised. I still have quite a bit to list in my store and file away but we are slowly getting there. Are you like me and have a big long list of projects that you want to get done around the house? The stock room has been on my list for ages so with not being able to spend all of my spare time sewing it has been a perfect opportunity to mark a few things off my list. Thanks for all of the lovely comments about my treasure hunting - I really do love it and have been really lucky lately to find some lovely things. I am planning to go to the market again this week so let's hope I get lucky again. Glad to hear your hand is healing nicely for yoy.It must have been great to be able to sew even for a little while.Hope the healing continues rapidly for you and you're able to do more real soon.Take care of yourself :) barb. 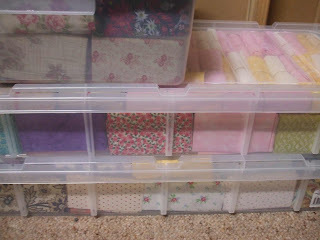 Wow, well you may have missed out on some stitching, but you made up for it by getting your fabric organized, that's some seriuos organizing. I was afraid after that flare up you had with you hand the other day it might have kept you from stitching a little longer. glad you're able to do a little now there'll be more each day! Glad your hand is healing and you were able to do a little stitching. dh and you have been busy organising your stock. Oh my goodness you would never get me out of that stockroom - how fabulous - glad you got to stitch a bit, just take it slow, girl! I'll have to go hunting to find a picture of the yoyo doily you are making. I want to make an entire tablecloth of yoyos...I bought the fabric last winter and I really need to get myself geared up and begin that project..yes I have a zillion things I want done too. Glad you were able to do some stitching. And, yes! Doesn't everyone have a list? I even have one hanging on my mother's refrigerator!! It is titled, "Sherry's To-Do List." And like all to-do lists, I get one thing crossed off and she adds two more! 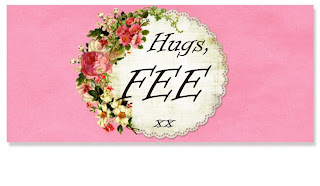 Fee just ask me , I would have helped you sort all that fabric out , lol ! All the best healing , I hope it all goes smoothly . 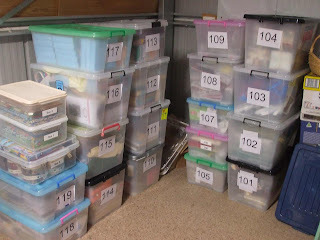 I wish I was as organised as you are, and I noticed the yubs are numbered, do you have a book describing the contentsnof each box? Taking stock and getting all things in to shipshape, sounds good to me. 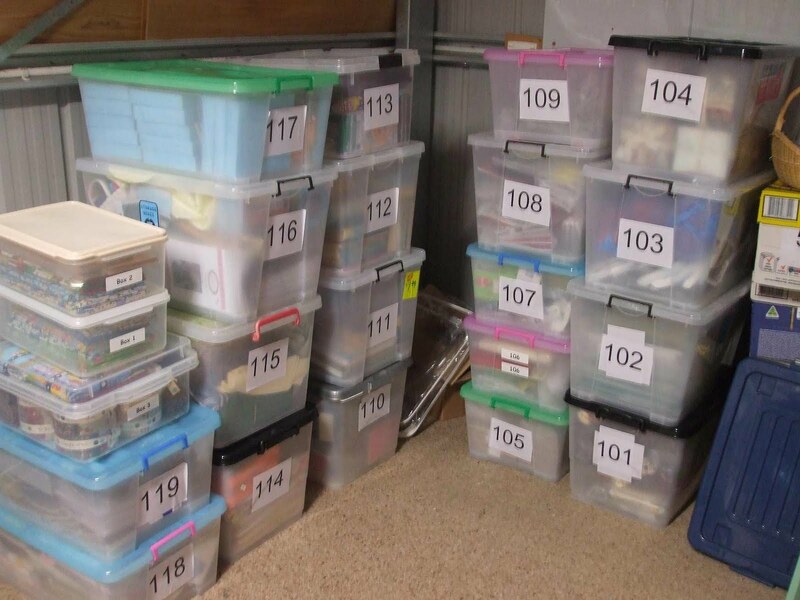 you certainly look veryorganised there Fiona, with all your bins numbered and stacked! Don't overdo things 'tho, still some recovery time needed. Glad to see that you can do that handwork. You are getting very organized for sure.